The Peugeot Paris pepper mill features the iconic silhouette known to all and blends the history of French heritage with Peugeot's legacy in mill engineering. 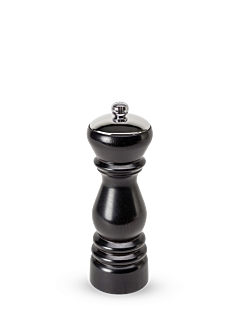 The undisputed standard for great chefs and culinary enthusiasts alike, indispensable in the kitchen, on every table every day as well as in the finest restaurants, the Peugeot Paris pepper mill combines a classic form with the patented innovative u'Select adjustable grinding system, and iconic colours. Developing along with evolution in materials, techniques and aesthetics, the Peugeot Paris pepper mill still retains its original efficiency, reliability and purpose. It is designed to extract all the diversity and intensity of the textures, grind and unique aromas of pepper, in search for a sensory gourmet experience par excellence. A design that takes tableware to the heights of the French art of living, as the symbol of simple, generous and refined cuisine. A genuine piece of art, symbol of the entire world of Peugeot's savoir-faire and aesthetics with the utmost refinement, the Peugeot Paris pepper mill is an archetypal mill. It is designed in the finest walnut and cherry wood and embodies the heart, soul and values of more than two centuries of steel-making, of establishing its identity and of resolutely French manufacture.